3D printing is new, shiny and a wonderful opportunity to make amazing things. From the outside, it looks easy but it can be really difficult to get the good quality information on it. That is where I struggled starting out. Here I’ll share the things I’ve learned on my own journey so that you might get to skip the first few mistakes I’ve made. We wanted bees. Fast. I wanted big fluffy ones but that’s beside the point. These beautiful little creatures are quite complex if you want an accurate representation of them. I dove right in to try to 3D print them. Reading the specs on various printers I naively assumed that if a printer could print a 100 micron layer then I could design to that size. This was not my cleverest moment. There isn’t much structural integrity in a strand of skinny melted plastic. My very first design never even got to print as the tail and antenna were too thin. So I started with a head, wings and body on a little stand. He was tiny. 3DHubs.com was recommended to me by a friend so I started there. I’ve continued to use their service and information over the last 2 years even after finally getting a printer myself so it was good starting point. I sent my bee off to be printed at a local, reasonably priced printer. It was upon uploading it to the website that I found out my overall component design was so small there were potential difficulties in printing it. My design was about 12mm tall. Thanks to the help of the nice person printing this, I learned a lot about what is possible with an FDM printer (the main type of consumer printer that melts plastics to make things). 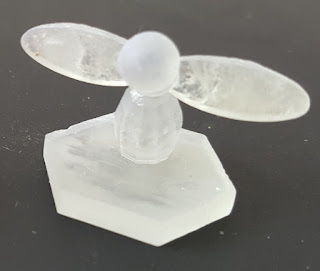 I also found out all FDM printers are not created equal and the printer suggested I try a resin printer to get the results I wanted. More on that in later posts. For now, the happy ending was that I increased the size of the print to 22cm and ended up with the lovely yellow bee from the start of this post. Decking Awesome Games was founded by Ciara Costelloe, Brian O Moore and Eoin Costelloe. We are an Irish board game company with a real passion for developing games to bring people closer. We ship our games internationally for the whole world to enjoy. Mafia and Werewolf are two names for the same game. It was originally called Mafia so this is how I will refer to it in this post. Mafia is a fantastic social deduction party game for all ages. One group of players are secretly the Mafia and the other group are civilians. Every night the Mafia take out one of the innocent civilians. During the day the civilians discuss who could have betrayed them. They must deduce who among them is covertly a part of the Mafia. By democratic vote, the civilians then eliminate their suspected Mafia member. Night and day continue until either all Mafia are eliminated or all the civilians. This is a simple yet satisfying game. You will wildly accuse each other of sabotage and betrayal. You will watch closely to everyone's reactions. You will be shocked when it turns out your kind friend was stabbing you in the back the whole time. Playing discs come in all shapes and sizes and have different effects in board games. I want to discuss the tactile feel and use of discs and how they can add a different level of experience in a board game. How can this small game piece add importance to a players decision? What games have utilised this to allow players to feel engaged? Pogs One of the most popular games in the 1990s was Pogs, a game of smacking one Slammer into a stack of Pogs. I remember playing this game as a kid with my cousin and friends. We all loved it. Everyone had their favourite Slammer that they used and cherished. Most of the Pogs were different, each one containing colourful images of popular characters or a funny little brown hairy creature. This game became more than plastic discs. It became an obsession. Dexterity in board games is about incorporating the real world as part of the challenge. The sweat on your palms, the strength of your muscles, the speed of your reflexes. These things are different for everyone and change regularly. Does relying on the dexterity of the player create too much chaos? Does removing abstract systems change the experience? Jenga Jenga was made in the early 1970s and has players build a tower of unstable wooden blocks. It requires nerves of steel and a steady hand. The enjoyment here comes from the tense moments as the tower wavers when players remove and place blocks. All the blocks are the same, however subtle differences occur during manufacturing that mean every Jenga tower ends up different. It's these varying levels of friction and size that adds continued enjoyment. 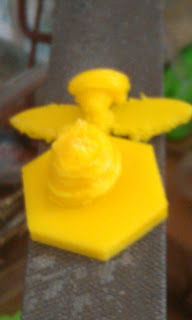 With my first bee printed I had an abundance of questions and ideas. This 2-part post and the next post happened in parallel but I’ve tried to put some order on the chaos. I still find it difficult in 3D printing to find the line between the effect of the material used in the print and the effect of the printer. Both advance and change so much, it’s still hard to tell. The design changes are explained later so we will start with the materials. Check out the picture of the bee from the last post. 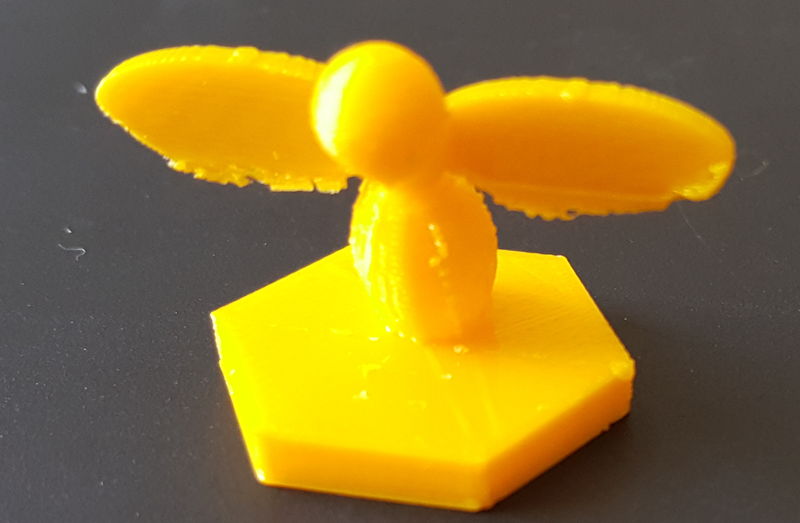 This was my first successful bee and it was done in yellow PLA, probably one of the most popular materials for 3D printing. If you look closely you can see very thin horizontal lines in the body and jagged edges. The lines are because the printer prints in layers of plastic. The thickness between the lines is determined by the nozzle diameter. Better printers mean thinner gaps. This print had quite a fine nozzle diameter compared to some of the prints I have seen. Some games create a whole new world to explore, one tile at a time. This is a great way to create a new experience every time you play. Each tile placed carves out a section of the world to discover. I want to discuss how tile laying changes the control of a game. How can tiles change how people approach games? Is it too random or too controlling? ScrabbleScrabble is an incredibly popular board game where players lay tiles down to form words. It started in 1931 as a game called Lexiko and ever since then people have argued as to whether or not they can spell. The board grows as more and more words are added. This gives players new opportunities for words. Players become paralyzed analyzing their next move knowing that other players will point out the faults in their plan. They are competing both with other players and with the draw of the tiles.